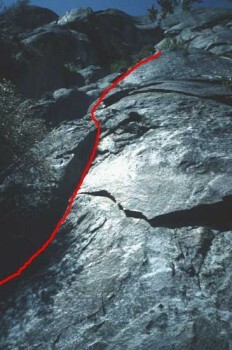 This fun little pitch climbs a some great steep knobs into a long section of low-angle wide cracks. This is the perfect pitch to build chimney technique as the wide sections are never harder than 5.6. The crux comes midway at a 5.7 bulge that is tricky but well protected. This climb will need more ascents before it is an ultra-classic but for now it a great way to get away from the crowds and climb some demanding 5.7 moves. Pitches 2 and 3 are also pretty good and rated 5.10d and 5.8, respectively. Which SuperTopo guidebooks include a topo for Center Route (pitch 1)?